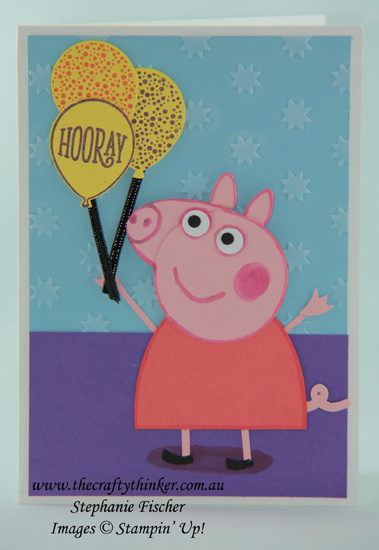 This card is for my little Great Niece who is besotted with Peppa Pig! Personally, I find Peppa Pig very unappealing but then, it's been a long time since I was three years old! The blue background is embossed and then I used a sponge dauber and Whisper White Craft Ink to highlight those stars. Peppa Pig herself is made with a couple of the Layering Ovals Framelits and a Layering Circle Framelit. Her hands were punched out with the Fox Builder Punch. The eyes were punched with the Cookie Builder Punch. Her ears are made with a small die in the Bouquet Bunch Framelits set. Her shoes are actually little bits cut from the bow in that same die set. For her tail, I confess, I rummaged in my collection of retired punches and used the Confetti Punch because .. well it's perfect for a pigs tail! Arms and legs are just little strips of cardstock. Once assembled, I used a Stampin' Blend to outline her and add the shadow underneath her. I hope this pig will pass the inspection of our little Peppa Pig afficionado!